Mosquitoes and ticks are more than just pests. Their bloodthirsty habits can make your pets sick with Lyme disease, heartworm and other illnesses. Many pet parents are torn between treating Muffy and Fluffy with medications and insecticides, fearing that the treatments will cause more trouble than they cure. The answer isn't to do nothing and leave your pets at the mercy of nasty little insects. Instead, take some pet-safe measures to control mosquitoes and ticks. The safest way to ensure that your pets aren't bothered by troublesome pests is to reduce their chances of coming into contact with the insects as much as possible. Keep your yard and home clean so ticks don't have any hiding places and so mosquitoes aren't attracted for a visit. Outside, get rid of brush, dead vegetation and old mats, pots for plants and tires. Don't allow rainwater to collect and sit, as standing water is a perfect nursery for mosquito eggs. 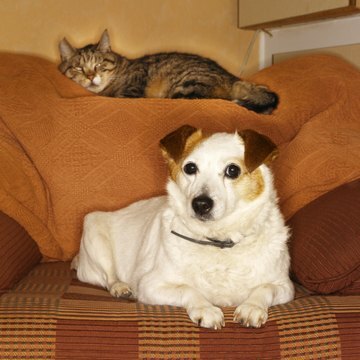 Indoors, vacuum and wash your pets' bedding weekly. Groom Muffy and Fluffy on a regular basis, too, taking care to check them over for mosquito bites or ticks after excursions outside. Parasites won't want to snack on your pets if they don't taste appetizing. Adding natural supplements to your dog and cat's food can do the trick. Brewer's yeast is among the most commonly used for repelling ticks and mosquitoes. In his 2007 book "Dog Body, Dog Mind," Michael W. Fox recommended adding 1 teaspoon of brewer's yeast for every 30 pounds of pet to your dog's or cat's food each day. Diatomaceous earth isn't typically used to control mosquitoes, but it is a natural tick repellent because it shreds and dehydrates them. Sprinkle some on Muffy and Fluffy, then work it down into their coats with your fingers for safe tick control. Kitties love catnip, and mosquitoes and ticks don't. Growing fresh catnip should keep your yard fairly pest-free, and rubbing fresh catnip on your pets will keep them pest-free, too. You can mix a spray to spritz onto your cat or dog to repel parasites. One recipe involves diluting floral-scented liquid soap or shampoo with water. Others call for karanja and neem, eucalyptus and lemon oil, or soybean and geranium oils to mix with water and spray onto your pets. If you're concerned about your pet ingesting a topical treatment by licking it, you can get a collar made especially for holding essential oils.